The uniforms worn during Napoleonic Wars represent the most elaborate display of pomp in the whole history of military dress. Click to enlarge the picture. Drawing by Anton Panin. 1) Militia, or People's Regimentation, was a form of organization that the Russian state used during national emergencies. Voluntary enlistment was popular with local regiments of the militia. There were no regular officers, and these positions were usually filled by prominent local citizens. 2) Dragoons generally assumed a cavalry role. Dragoons rode larger horses than the light cavalry, and they also wielded straight swords (rather than curved swords). The name “dragoon” is possibly derived from an early French carbine, which was decorated with a dragon's head. After the Napoleonic Wars, all Russian cavalry were designated as dragoons. 3) Hussars, or light cavalrymen mounted on fast horses, were used for skirmishes and for scouting. 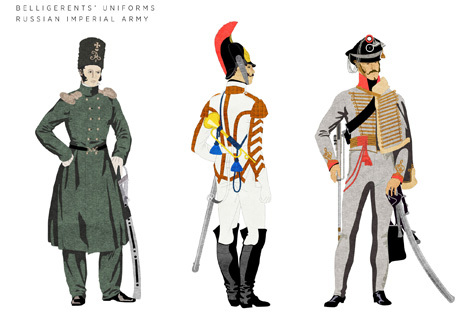 The Russian Imperial Army has contained hussar regiments since the 18th century. These regiments were enlisted, not conscripted like the rest of Russian army, and of a status between regular and irregular cavalry. Click to enlarge the image. Drawing by Anton Panin. 1) Sappers performed a variety of military engineering duties, including bridge-building, demolition, field defense, general construction, and road construction and repair. Sappers were very common in the French army. They gradually disappeared in the 19th century, with the exception of the French Foreign Legion, which still retains a sapper unit. 2) Grenadiers were typically the most physically powerful soldiers on the field and would lead assaults in battle. Grenadiers would also often lead the forces when storming breaches in siege warfare. Grenadiers were the elite of line infantry and the veteran shock troops of the Napoleonic infantry. 3) Drummers played a key role on at the battlefield: their drum cadences set a steady marching pace and elevated troop morale. Military drummers were also employed on the parade field when troops passed in review, as well as at various other ceremonies. In addition to these functions, drummers also played an important communication role in the Grande Armée.